When AAAS Fellow Andrew Fountain began studying glaciers more than 30 years ago, his research area was considered by many to be a bit of an oddity. These days that's all changed. The general public is now keenly aware that anthropogenic climate changes are cranking up Earth's thermostat, with far-reaching effects on the world's glaciers. Recent studies show that glaciers are melting at an alarming rate, and as a consequence, sea levels may rise as much as 23 inches or more by 2100. Fountain, a professor at Portland State University in Portland, Oregon, examines the inner workings of glaciers. The complexity of this field has led him to degrees in physics, atmospheric sciences, and civil engineering. It's also has taken him from the Arctic to Antarctica, and has given the 61-year-old the ruddy look of a field researcher—a persona aided by his salt-and-pepper beard and piercing, pale-green eyes. While much of his recent research has kept him close to home, where he examines disappearing glaciers in the American West, Fountain says his heart belongs to another region: Antarctica. His first trip there was in 1993, when a colleague who worked at the U.S. Geological Survey asked him to join a National Science Foundation-funded, long-term ecological research project, which continues to this day. Fountain leapt at the opportunity. "What glaciologist wouldn't want to go to Antarctica?" he says. The project is centered in the McMurdo Dry Valleys, so called because they make up a snow-free, frozen desert. Fountain says being on an ecological project was, at first, an odd fit since he's not an ecologist. But in the Dry Valleys, glaciology and ecology converge in fascinating glacial structures called cryoconite holes—cylindrical depressions ranging from 4 to 145 cm in diameter that hold liquid water that is filled with colonies of flourishing microorganisms. While cryoconite holes are found the world over—on the surface of glaciers, frozen lakes and sea ice—in the Dry Valleys' inhospitable environment, they form inside glaciers. "So it was like, 'What's going on with these things?'" says Fountain. In his search to understand how Antarctica's formations evolved, Fountain, now a leading expert on cryoconite holes, would learn that it has to do with sublimation, the transformation of water from a liquid to a gas. A cryoconite hole forms when sand, dust and other particulates—often laden with bacteria—land on a glacier, lowering its albedo, or reflectivity. Consequently, solar radiation that's normally reflected is instead absorbed by the ice, melting the glacier and creating a water-filled hole. In the Dry Valleys, the glacial melt is difficult to spot, lending mystery to how the holes form. Fountain and his team discovered that the melt was happening inside the glacier, where sunlight heats trapped particulates, a process enabled by a miniature greenhouse effect. Meanwhile, at the glacier's surface, the melt sublimates quickly from solid to vapor, giving the illusion that melt isn't occurring. Fountain's work in the Arctic also has involved demystifying poorly understood glacial features. 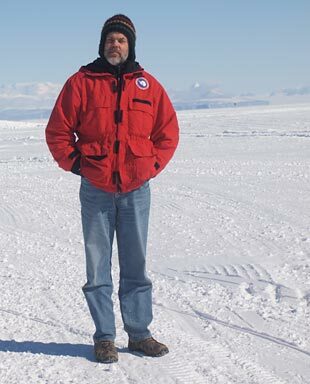 In the early 2000s, Fountain traveled to Arctic regions of Sweden to study how water flows inside temperate glaciers. As with the Dry Valleys' cryoconite holes, he suspected a mystery was at work. At the time of his trip, many researchers believed temperate glaciers contained tubular conduits that allowed water to flow through and out of them. He suspected the ice would tell another story. Using a pressurized, hot-water drill, Fountain and his fellow researchers bored into a Swedish glacier, revealing deep, jutting cavities—not tube-shaped conduits. This discovery led Fountain to develop a model of how water flows through temperate glaciers. This has allowed him and other glaciologists to more accurately project how climate change will affect the rate of glacier melt. Tracking this loss—called retreat—in the Western U.S. has been the focus of a large part of Fountain's recent work. Employing aerial and historic photographs, geologic evidence, and GPS, Fountain conducted surveys of glaciers across the U.S. West. The surveys indicated that the region's mountain ranges underwent rapid glacier melt from early- to mid-20th century. This disappearance closely mirrored climatic changes. The glacial loss picked up again starting in the 1970s and 1980s, with a rapid acceleration observed starting in the early 2000s. While the melting varies from mountain range to mountain range, the pattern is nonetheless clear. If the trend continues, Fountain estimates most glaciers in California's Sierra Nevada Mountains and Glacier National Park in Montana will disappear in the next 50 to 250 years. Yet, says Fountain, unlike glacial loss elsewhere in the world, much of the U.S. West is comparatively lucky, retreat there is expected to have a minimal effect on area hydrology. "Like everything else in climate change, there will be winners and losers," he says.